Budding runway model Hailey Baldwin made her Dolce & Gabbana runway debut over the weekend during Milan Fashion Week. The young It model strutted down the runway wearing a fitted little black dress and a signature D&G hairpiece with gorgeous red roses. The collection included several bold pieces with countless embellishment details in nearly every look. From jeweled miniskirts and oversize blouses with statement sleeves to designs with playful prints, the spring collection is anything but boring. And when it comes to accessories, it’s all about major earrings, delicate necklaces, and gorgeous headpieces. 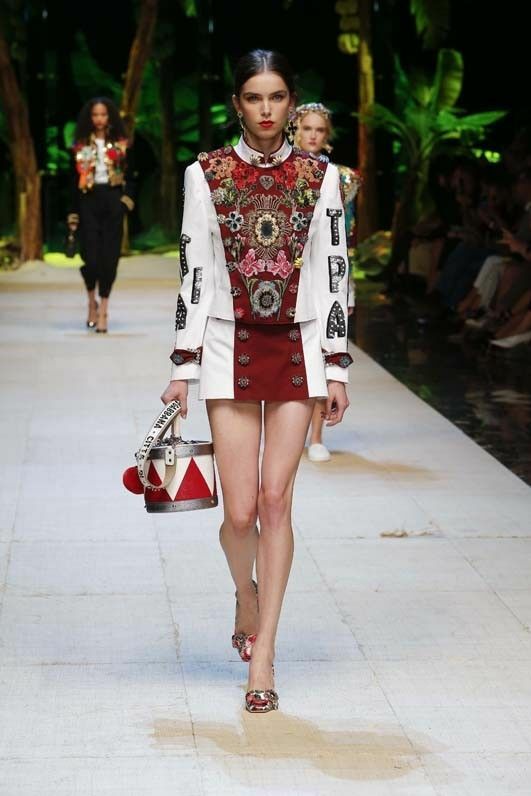 Keep reading to see every look from the D&G S/S 17 collection, and while we await their release, be sure to shop current Dolce & Gabbana pieces.